We are conveniently located in the picturesque town of Rocky Harbour, in the UNSECO World Heritage Site of GrosMorne National Park. 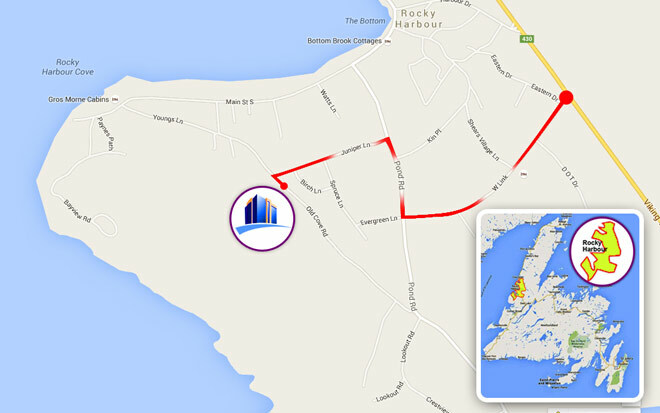 Exit the Trans Canada Highway – Route 1 at Deerlake and head North on the Viking Trail for 67 km to Rocky Harbour and Bambury’s Hillside Chalets. Here you will discover the best quality chalets that our region has to offer and a stand alone view of GrosMorne Mountain and the beautiful seaside harbor that we are so proud to call home. You can arrive as early as 3:00pm, or as late as you need. For customers arriving after hours you can go right into the chalet indicated on your reservation and your keys will be waiting for you on the table!